Our Equestrian Art show is displayed on a nationwide tour throughout Mexico totaling more than 100 presentations annually. 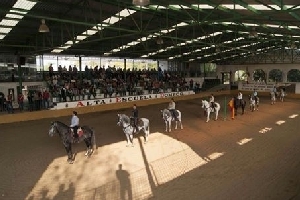 We also produce seasonal-thematic shows within our facilities, these cultural performances greet the audience with an authentic equestrian ballet and tints of different cultures. 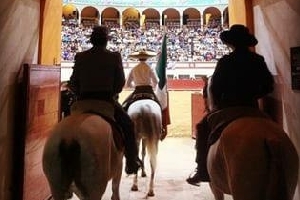 The Domecq Equestrian Show is considered the most important and popular in Mexico due to its 50 uninterrupted years of constant presence in festivals, fairs, expos and celebrations, reaching every corner of the country. The Show is presented in more than 100 venues each year and provides its viewing public a folkloric show that proudly embraces the most revered dances, music and popular customs, creatively intertwining equestrian demonstrations of classical dressage. 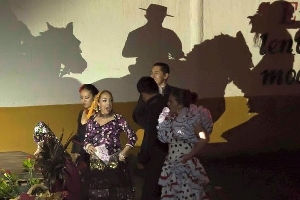 Today the Show is an essential part of any festivity or festival in Mexico. 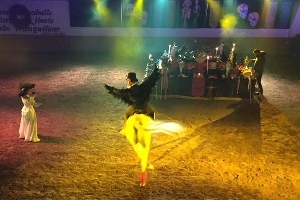 Splendid Azteca and Andalusian horses and their experienced riders demonstrate the ancestral art of classical dressage accompanied by other artistic elements such as Mexican and Spanish regional dance performances, traditional “Charrería” exhibition (Mexico’s national sport), horse driving exhibitions and singers on horseback performing live, to mention a few. 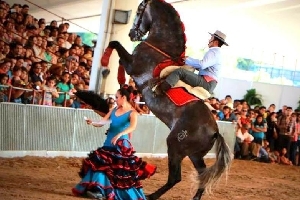 A performance that thanks to the skillful riders and the breathtaking magnificence of the horses, offers the audience an authentic equestrian ballet, acknowledged as a genuine Mexican cultural tradition. 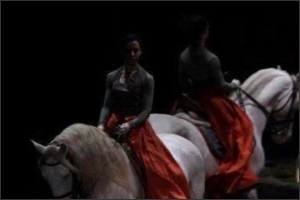 A dancer and two horses perform an authentic equestrian ballet in a short, but rich show. Thanks to the virtuosity of the horses, and the beauty of the dancer, the audience will appreciate a graceful Classical Dressage show and regional dances. The show lasts for 30 minutes, perfect for events in small venues, such as graduations, birthdays, weddings, and others. 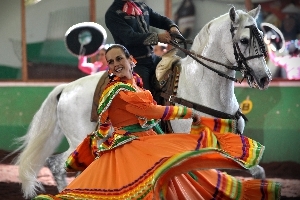 Majestic horses and riders performing Classical Dressage exercises are joined by beautiful dancers that perform regional dances from Mexico and Spain. A “Charrería” exhibit, a live singer of Mexican music, and equestrian harness complement the exhibition. It all takes place from 60 to 90 beautiful minutes. 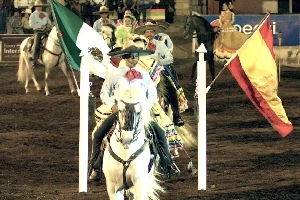 Horses and their riders along with professional dancers take the audience to a trip through Mexico’s history, where a mix of pre-Hispanic, Spanish, and Mexican culture occurs. This production is perfect for VIP events, with big stages where the audience will appreciate many artists on scene. This show lasts for 90 to 120 minutes. 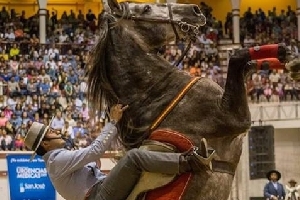 An inspired and free version of the Opera Carmen by George Bizet, Habanera, is a show full of flamenco and bullfighting touches, always inspired and performed with art, beauty, and versatility of the Spanish and Azteca horse. 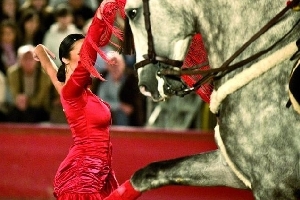 During one hour, over 15 horses, 30 performers, a simulated bullfight, and a great production, takes the audience, through lights and sounds, to a gypsy tavern in Sevilla...to the country, and finally, the bull ring to witness one of the biggest tasks of the torero Escamilla, who has stolen Carmen’s heart. 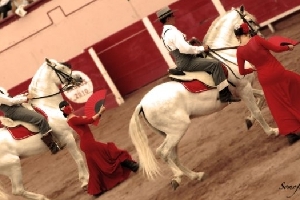 The flamenco, the horses performing Airs above the ground and Classical Dressage exercises and the horses could not diminish the bursting passion, and the tragic end of Carmen. A production that recalls the cultural elites of the Opera, infects the audience with flamenco dance, horses… breathtaking. ALTA ESCUELA DOMECQ newest production “La Catrina” is a concert-show dedicated to the Mexican festivity of “Dia de Muertos”, festivity which has been recognized by the UNESCO as an Intangible Cultural Heritage of Humanity. The show gathers tradition and culture with performing actors, singers, riders, dancers and horses reenacting a tribute to renowned musical voices of diseased singers. Guided by “El Catrin”, the lord of the dead, and “Mictecacíhuatl”, the lady of death, the audience will experience the path of the dead…from the soul’s ascension, to the ritualistic funerals, all the way to the creation of a traditional Mexican altar of the dead. Six contemporary dance performers represent the souls and spirits of the underworld. Splendid voices reincarnate the musical voices of Mexico. Horses and riders pair the Tableaux Vivants with classical dressage exercises, dressage in freedom, roman riding and horse harness creating an unprecedented show. After the death of her second husband, Bernarda Alba imposes her five daughters a rigorous mourning of eight years, forbidding them to go outside of the house. When it is announced that the first-born, Angustias, inherits her father’s fortune, Pepe el Romano, a local scoundrel, wants to put his greedy hands on the money. Angustias is betrothed to Pepe, who instead, falls in love with Adela, the youngest sister, who is willing to become his lover. When Bernarda finds out about the affair, she shoots Pepe with the help of Martirio. After hearing the shot, Adela hangs herself thinking that Pepe is dead. At the border of madness, Bernarda demands secrecy and mourning for the death of her virgin daughter, Adela. ElemEntz is a jaw-dropping show that combines dressage, dance and acrobatics. In ElemEntz, Spanish and Aztec purebred horses perform dressage stunts that merge with dazzling dances inspired from different parts around the world, as well as with the art of circus, featuring stilt walkers, aerial dance and waterbowl acrobatics, and mesmerizing fire joggling. All these components, as well as the original music composed specifically for the show, are harmoniously merged and combined in the different choreographies, where each and every number is developed of as a whole, and at the same time, as a singular component of ElemEntz. Is an epic journey that allows us to accompany the history of the horse, from its domestication in the Middle East, its passage through the Iberian Peninsula, and until its arrival in our country. This magical journey shows us the intimate relationship that exists between the hearts of horses and humans. EQUINNUS is a show that combines acrobatics, high school and dance, to create an incredible exhibition of equestrian arts combined with human skills on stage. Its blocks include "El Origen", which places us in the Middle East, with the inclusion of horses in the mystical life and cosmology of the first civilizations; "Iberia", which places us in Spain, with the Roman influence and the Moorish conquests to the peninsula, where an intimate and passionate relationship with horses arises, something that can only conjure with the history, magic, feeling and passion of Spain; and "The New World", which describes how, to a mystical and unknown world, travelers of the so-called old world have arrived, and with them a new era begins where horses play a fundamental role in daily life, not only at work , but in the entertainment and love of all, creating a new way of living based on the syncretism resulting from the Spanish and Mesoamerican culture. It is at this point that the horse acquires a primordial role for Mexico and is integrated into the life of what is now our country. The milestones of Mexican history are traversed to this day.